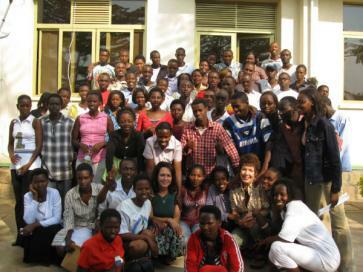 They were young children in 1994 when Rwanda experienced the genocide that left 800,000 of them orphaned. In the wake of the violence, Rwanda’s social structure collapsed, severely affecting schools, health care, and the economy. Meeting the basic needs of food, shelter, clothing and education overshadowed the daunting task of healing the orphaned children’s traumatic memories, injuries, illnesses, and fears. UNICEF estimates that 96% of the children witnessed the massacres, and many children who survived were mutilated and raped, resulting in an unprecedented level of trauma among children. In 2007, Lori Leyden, Ph.D., traveled to Rwanda with her team to work with orphaned genocide survivors and orphaned heads of household (children caring for other children). After Lori worked with the kids using energy psychology techniques, their trauma outbreaks were reduced by 90%, a significant relief in a situation where 200+ teenagers share a one-room dormitory. Lori uses a “train the trainer” model. 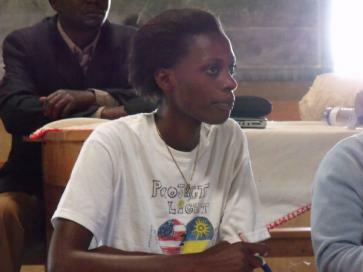 She has now worked with over 550 orphans and other genocide survivors, and those young people have trained hundreds of others. In Lori’s work, trauma healing is the first priority. There were times, though, when she wondered if it would even be possible to heal the depths of the traumas, the intrusive memories, nightmares, and sense of hopelessness that have been the daily reality since 1994 of these young people. Looking back, what struck Lori and members of her team most clearly was the resiliency and human dignity they witnessed in the kids. Lori realized that if these kids, with all the horrors they had endured, were willing to try to forgive, then there truly was a potential within all human hearts for world peace. “Now we have hope and we know this is not our burden alone to carry. Forgiveness is so hard but we are willing now because we know we need each other.” --Celestin, Student Leader representing orphan genocide survivors. In 2008, Lori and her team decided to include celebrations in their work. They started with birthdays. With all the kids in a big circle, Lori called out “January” and all the kids with birthdays in January were to enter the center of the circle to be sung to and celebrated. Nobody moved. “February,” called Lori . . . again, nobody moved. Month after month went by until finally at “September,” with the center still empty, Lori and the team realized that these kids literally did not know their birthdays. Having grown up with no loving families to mark their birthdays as important events to celebrate, “Happy Birthday” was not part of their reality. Lori’s vision extends far beyond healing the trauma, as critical and foundational as that work is. The orphans, now ages 16 to 25, are graduating high school in a country still not fully on its feet, and they find themselves with a diploma but few options for employment. Hope is still scarce. Thus, economic sustainability comes next—the young people need to be able to earn a living. Lori’s model of “hand-up, not hand-out,” is evolving as the first 12 young people, called “Ambassadors,” have graduated her Project LIGHT program. Two Ambassadors are in college, and two have obtained driver’s licenses (hard to do in Rwanda), so will be employable in professions that require driving. And all the Ambassadors are learning entrepreneurship, having launched a soap-making business. The lush landscape of Rwanda provides ample ingredients for making soap, and all 12 Ambassadors are learning all aspects of the business. Ultimately, Lori’s vision includes Youth Healing Centers like this all over the world, easily linked with communications made possible by today’s technology. 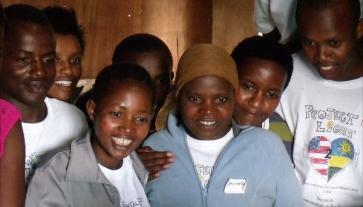 Rwandan orphans skyping with American students.